Geometry is a hands-on subject. What better way to explore the concepts of area, perimeter, and volume than actually measuring area, perimeter, and volume? With this helpful resource, you will build polygons out of pipe cleaners and flexible drinking straws, explore Mobius strips made from index cards, model the Pythagorean theorem using cheese crackers, and much more. 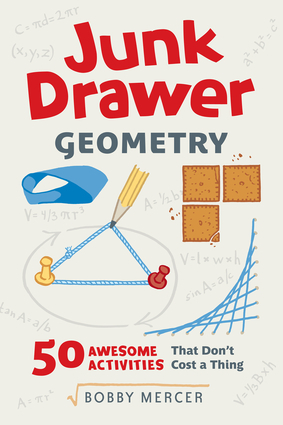 Junk Drawer Geometry proves that you don't need high-tech equipment to comprehend math concepts—just what you can find around the house or in your recycling bin. Each of this book's 50 creative geometry projects includes a materials list and detailed, step-by-step instructions with illustrations. The projects also include ideas on how to modify the lessons for different age and skill levels, allowing anyone teaching children to use this to excite students. Educators and parents will find this title a handy guide to teach problem-solving skills and applied geometry, all while having a lot of fun. Bobby Mercer has been sharing the fun of science for more than two decades as a high school physics teacher. He is the author of Junk Drawer Physics, Junk Drawer Chemistry, and Junk Drawer Engineering.